Write directly on this chalkboard table top for a fresh twist to the classic activity table set. Alone, or with friends, your child will stay busy on their next work of art with this table that includes 2 stools and a bench. Finished in non-toxic black legs and stools with white accents. Like all Little Seeds products, this purchase helps support a major environmental initiative. Discover how this can help you and your child involve your community in habitat rebuilding. Expand your collection by mixing and matching this table set with any Rowan Valley or Monarch Hill collection pieces to create a one-of-a-kind space for your child. 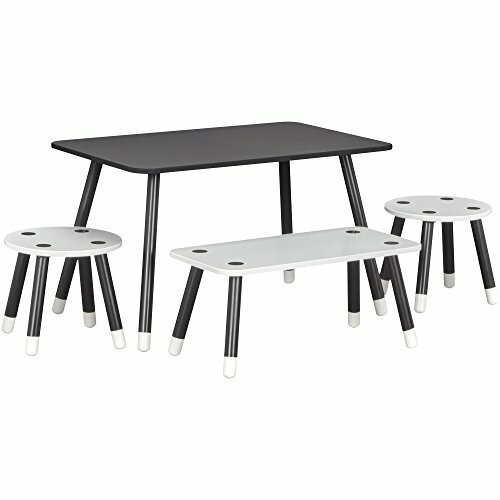 Alone, or with friends, your child will stay busy on their next work of art with this table that includes 2 stools and a bench. Stability tested to meet or exceed youth standards. Purchase supports the Little Seeds Animal Habitat initiative. View More In Tables & Chairs. If you have any questions about this product by Little Seeds, contact us by completing and submitting the form below. If you are looking for a specif part number, please include it with your message.